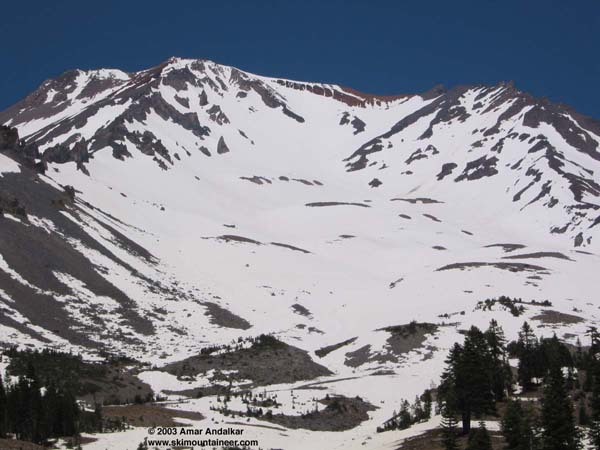 Following a lovely final day of June skiing on Lassen Peak, (see report), I headed north to Mount Shasta to get my July turns in as early as possible. I was hoping to ski the Hotlum-Wintun Ridge on the east side (one of my favorite ski routes), but the report said the road was still blocked by trees 5 miles from the trailhead. So I decided to try the Hotlum-Bolam Ridge on the north side instead. However, as I drove to the trailhead via US 97, the stunning view of Shasta's north side brought disappointment: surprisingly, the Hotlum-Bolam route looked to be almost completely bare below 10000 ft. Not wanting to hike 3000 vft from the Northgate trailhead just to reach snow, the only good option looked like a retreat back to the south side and Avalanche Gulch, where I figured it would still be skiable within a few hundred feet of the trailhead and I hoped the suncups wouldn't be too bad. I woke up at dawn at the Bunny Flat parking lot, only to find further disappointment as a huge cloud was wrapped around the upper slopes of Shasta, obscuring everything above 11000 ft. So I dropped plans for an early start and figured I'd try to wait it out. The cloud thinned and thickened a few times, but it never seemed to want to go away, so I finally decided to give it a shot anyway and began hiking uphill at 6:30 am. By 7400 ft, I was on continuous snow and switched to skins, with ski crampons mandatory on the solidly frozen snow. After 7 am, the clouds looked to be breaking up, and by 8 am they were nearly gone, replaced by an occasional gusty breeze. The snow in the main part of the gulch softened a bit as the sun finally hit it, and I skinned up to 11500 ft before increasingly steep and firm slopes led me to put the skis back on the pack and crampon up. Unfortunately, the combination of low freezing level (forecast to be 12500 ft) and the strong breeze kept the snow above 12000 ft solidly frozen. It was clear that the upper mountain would never soften enough for good skiing, even if I waited all afternoon. So I abandoned the summit attempt and just skied down from the 12800 ft saddle beside Thumb Rock at 1:30 pm. The upper part was frozen and rough, but below 12000 ft it softened into better and better corn. It looked like some new snow a week earlier had filled in most of the suncups and runnels above 10000 ft, so the skiing was actually really nice. Even below 10000 ft, decently smooth snow could be found by sticking to the right side of the gully far above the large boot pack (i.e. stampede path), and on this day it had not turned to mush even by 2 pm. By following the correct (leftmost) exit gully in the woods below 8000 ft, I skied out to 7100 ft with only a couple of short ski carries, within a 5 minute walk of the trailhead. The snow in the woods was the brightest yellow I have ever seen, covered by a dense layer of pollen which thankfully was not sticking to the ski bases. Even bare ground showed a thick dusting of this pollen, which I assume comes from the Shasta red firs which are the dominant tree species there. Overall, it was a very good day of skiing, 5700 vft on mostly nice snow, despite finding the upper mountain too frozen to make skiing from the summit region worthwhile. This photo shows the exceptionally good snowcover in Avalanche Gulch, given that it is July. The Left of Heart variation (left of Red Banks) appears to have continuous snow from the summit plateau, and that was my planned descent route if I had continued to the top. The West Face which we skied in early June is visible at upper left, the top few hundred feet are now melted bare.